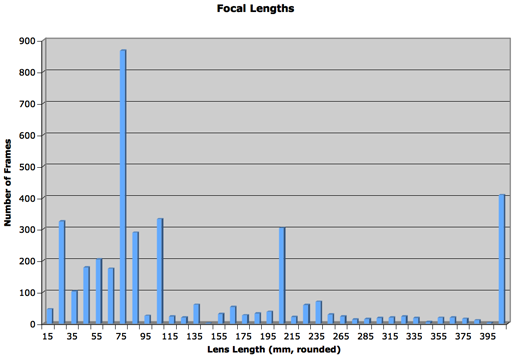 One of the things that I’ve wished for in Lightroom is a focal-length histogram. I’d love to be able to select a bunch of pictures and ask “which focal lengths did I use most often?” I mean, I know which lenses I use most often, but which focal lengths do I actually use? That finds all of the .xmp files in the current directory (and subdirectories), extracts their exif:FocalLength lines, then extracts the actual focal length number, sorts them numerically, and then counts how many occurrences of each focal length it sees. I shoot a lot of pictures in the 24-100mm range. 70mm is the most common, but the 35, 45, 55, and 65mm lines are all pretty big. It looks like I use my 24-70mm lens in the middle of its range quite a bit, while my longer lenses mostly get used at their extremes.